Today brought me the challenge of finding a sitting, reading, writing place outside where it was sunny and calm. But if the spot had sunshine, it also had wind, and if the spot was wind-blocked, it was also sun-blocked. I settled for sun combined with wind and I made due. But as I struggled holding down my pages with one hand, and constantly tucking hair behind my ear with the other, I couldn’t keep the thoughts of Lizzie Borden at bay. I laid across the bed of a wagon filled with scrap metal and let the sun warm my face. I closed my eyes and when I opened them, it was as if I was looking at the sky for the first time ever. I don’t recall it ever looking so blue. Jason pulled up to catch the horses. He didn’t even notice me sprawled on that wagon of junk. The cows in the next pasture lined the fence to stare and watch the action of horses avoiding harnesses. The horses lost. They were loaded into a trailer and driven off. One by one the cows grew bored and dispersed to munch the grasses. I wonder why the phrase isn’t “curiosity killed the cow”? I haven’t seen the cat for several days. Why do I have a feeling of dread in the pit of my stomach that she is flattened underneath one of the seven huge round hay bales that are lined up like soldiers in front of the house? All except one is in formation. I imagine a sargeant in its face yelling. But the day is too nice for screaming. I can’t wait until this trailer is in a completed state. I could be working to make that possible, but after all it is Sunday. 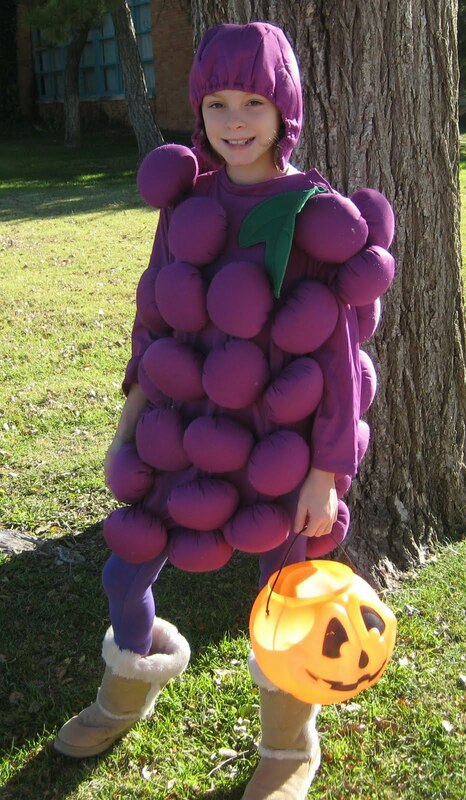 She loves Halloween and last year she went as a bunch of grapes. 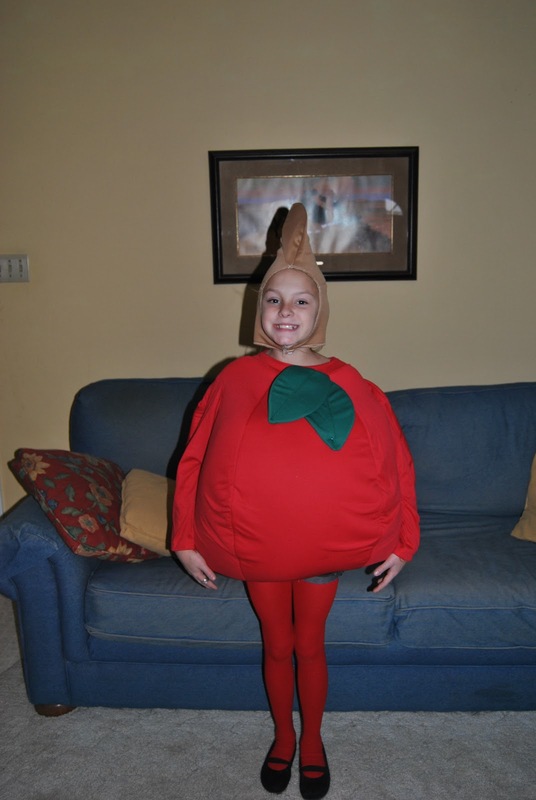 This year she told me she was going to go as an apple. Grapes last year and an apple this year. I do believe she has a theme going on. Author’s Note: Everyone thought she was a tomato. The winner of the $25 gift card is Brandi Cayce! This was a fun contest and I enjoyed reading all the responses. Thanks for all the ideas and we’ll do this again soon!! !